The current 16th Lok Sabha will complete its five year term in May 2019. Mostly, the Budget Session will be completed by Feb 2019 end and all the political parties may get ready to face the next General Election. Sansad Ratna Awards Committee will present the Awards immediately after the completion of all the sessions of 16th Lok Sabha, but before the announcement of next General Elections. Every year, based on the cumulative performance, Sansad Ratna Awards are being presented. In 2019, a few members will be honoured with 'Sansad Maha Ratna' for their extraordinary cumulative performance. 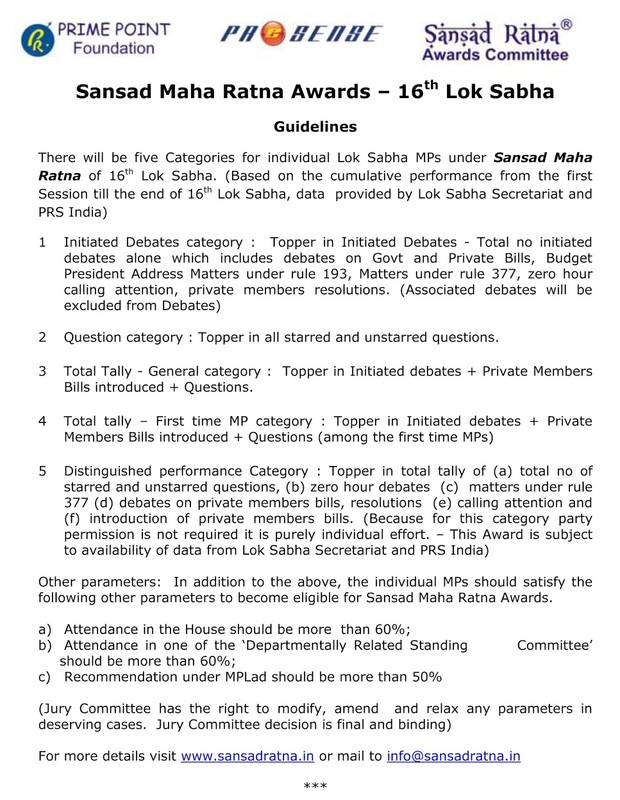 The Jury Committee has approved the guidelines for Sansad Maha Ratna Awards of 16th Lok Sabha. Since the selection process is done transparently, we are publishing the guidelines for the information of MPs and general public. 2 Question category : Topper in all starred and unstarred questions. 3 Total Tally - General category : Topper in Initiated debates + Private Members Bills introduced + Questions. 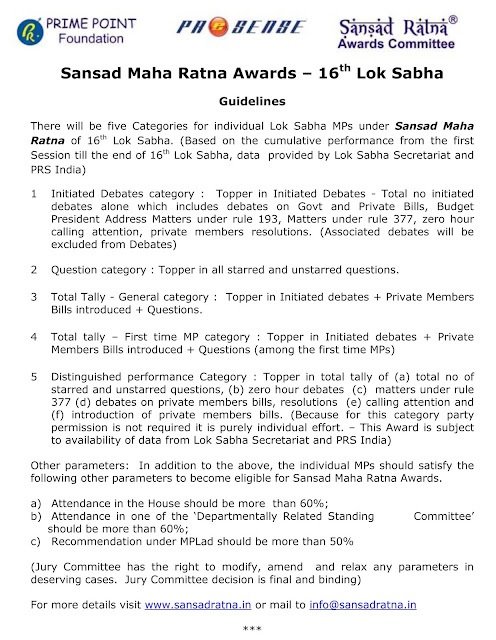 Other parameters: In addition to the above, the individual MPs should satisfy the following other parameters to become eligible for Sansad Maha Ratna Awards.